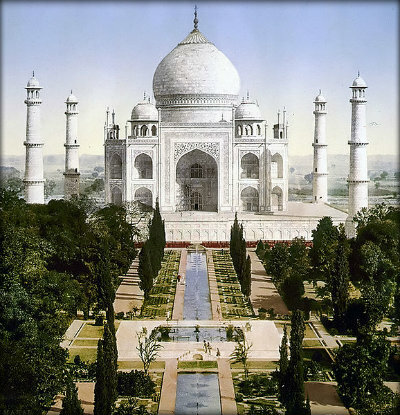 The Taj Mahal is located in Agra, northern India and was constructed between 1631 and 1648. 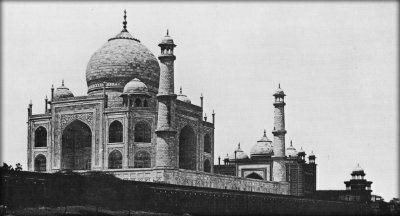 The emperor Shah Jahan ordered its construction in memory of one of his wives. The beautiful building was designated a World Heritage site in 1983. Its architectural styles include elements from Indian, Islamic and Persian buildings. The Taj Mahal is one of the most well known buildings in the world. There is a replica of it in a Chinese theme park, and the Trump Taj Mahal hotel and casino in Atlantic City is modeled on it. The marble dome was originally covered with gold. It is 115 feet in height and is sometimes called an onion dome because of its distinctive shape. The Taj Mahal’s main gate was built from red sandstone. It is 30 feet high and decorated with verses from the Holy book, the Koran, in Arabic. The actual graves of the emperor and his wife can never be seen by vistors to the monument. They are buried about 7 feet under the ground. An estimated 20,000 workmen worked every day for over 20 years to complete the mausoleum. The marble used in its construction was carried to the site on the backs of 1,000 elephants. The four minarets are each 120 feet high. They all lean out slightly, to compensate for the height and to make them look perfectly straight. In the event of an earthquake, they would also fall away from the main building. Almost 30 types of precious stones were set into the white marble. Although many of these have been stolen over the centuries, the holes are still there. Depending on the time of day, the Taj Mahal often appears to be a different color. One of the best times to see it is at night, under a full moon.